Learn how to turn right with bicycle lanes! 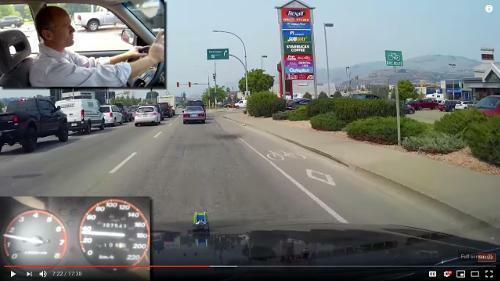 Hi there Smart Drivers. Rick, with Smart Drive Test, talking to you today about: Bicycle lanes and turning right, for the purposes of a road test. Now, just before we get started here, be sure to hit that subscribe button... right about there. 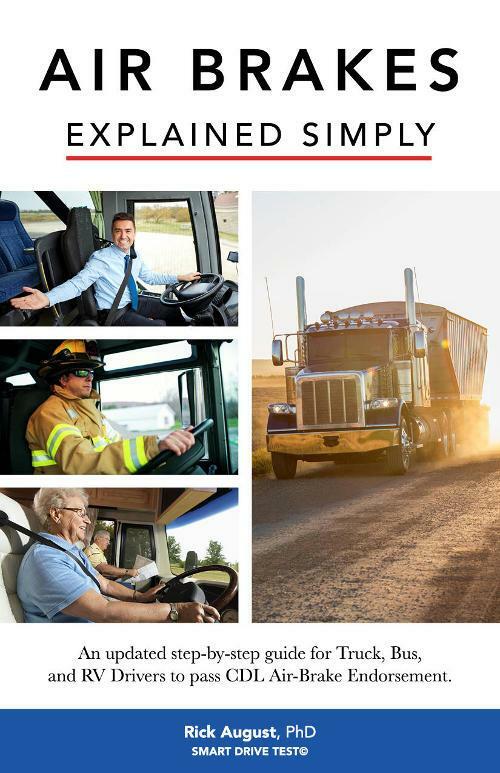 That way, you'll get access to all of the great information, as I get it available for you, for you to be successful in passing a road test, or starting your career as a truck or bus driver. Now, as you can see the bicycle lane behind me, these are beginning to make inroads into the driving landscape, and are something that you have to deal with for the purposes of a road test. And, I had a comment from Jessica Pang, and Nani Hallam, both of those Smart Drivers wanted some more information about making right-hand turns, when they encounter bicycle lanes, as the one behind me here. Now, one of the things that I'll start with is, in North America, not in other countries, I know for in Australia, for example, lanes of traffic are divided by white lines and yellow lines. And, yellow lines designate traffic going in opposite directions. White lines designate traffic going in the same direction. So, the bicycles are going in the same direction as traffic. 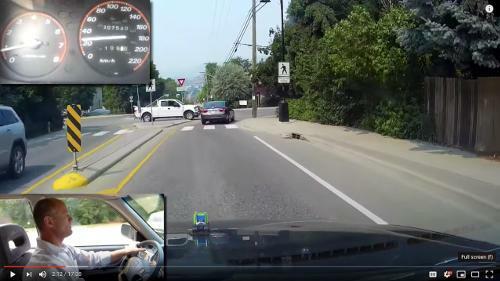 Although, here, in British Columbia, there seems to be some odd thing of cyclists riding against traffic, which really kind of weirds me out when I'm driving my car. But, it's part of the driving landscape here. So, know that solid white lines, you can't cross over those, for the purposes of a road test. And, most of the time the solid white lines are found near intersections, or crosswalks. So, keep an eye out for those, at those locations, while you're on your road test. And, you cannot deviate into the bicycle lane, for the purposes of a road test. So, know that as well. And, so what we're going to do today, is we're going to hook up the cameras, we are going to go for a drive, and give you some more information about bicycle lanes, and how to deal with bicycle lanes, for the purposes of making a right-hand turn, on a road test. So, stick around, we'll be right back with that information. Hi there Smart Drivers, welcome back. 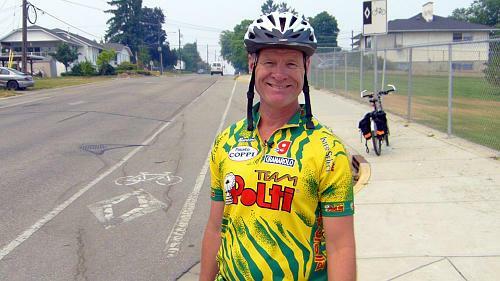 Rick, with Smart Drive Test, talking to you today about bicycle lanes. As you can see, the bicycle lane, along the right hand side of the road here, is a solid white line, which means that you can't cross over it, and you can't drive in it. Now, here at the roundabout, the vehicle has stopped. You can see that the bicycle lane terminates, and the curb goes in. Therefore, if you do encounter a bicycle coming up to the roundabout, you need to let the bicycle go first, and then proceed in behind the bicycle. Got a pedestrian here, crosswalk. And, you can see the bicycle lane here on the right. And, we're going to make right-hand turn down here, at the intersection, at the traffic light. Now, do not cross into the bicycle lane at all. Do not deviate into it. Actually, stay a little bit away from it, especially in the summertime. Now, you can see that there's dotted lines down here, and that's where you want to cross the bicycle lane, at those dotted lines, because that's the place that they want you to cross. And, before you cross over on the bicycle lane, be sure that you shoulder check, and ensure that there aren't any bicycles that are going to proceed straight through the intersection, when you're moving in position your vehicle to turn right, in the right-hand turning lane. And, that's how you do it, at most of the intersections. Now, we're going to do another chunk of road here, and I'm going to show you something else that they've done on new roads. What they do, is they fix the road, and they put in a new bicycle lane on the new section of road, and the road continues down, and then the bicycle lane terminates, because there isn't a bicycle lane on the old section of road. And, that's what they've done, over here, on this piece of road. And, that's the other thing, when you're driving in urban areas, that you're going to have to watch out for, is the disappearance and reappearance of the bicycle lanes. Because, that's one of the things that you're going to have to watch for in urban areas, is the disappearance and reappearance of bicycle lanes, because on new sections of roads that they've repaired, they put the bicycle lane in, and then on the old section of road, it doesn't appear. Now, we see that there's a bicycle lane, here in front of us, and the line doesn't go across the intersection, but I can see it over there on the right. Stop at the correct stopping position, and then I creep forward, moving my vehicle to the right. The way is clear. And, the bicycle lane is there. I don't want to deviate into the bicycle lane, I want drive out far enough that I can get into my lane, without getting into the bicycle lane. Now, we go over the railway crossing here, or the railroad crossing, as it's called in North America, and the bicycle lane terminates, so they're going to come out around the cars here. So, we're going to go back around, and do another turn at a bicycle lane. And you saw there, that the light went yellow as I came up to the intersection, I'm past the stop line. However, do not back up. Simply stop. That's okay, for the purposes of a road test, because you had to stop for the yellow light, because it kind of caught you out there. So, that's perfectly acceptable, you came to a stop. Do not back up. There's a little bit of room to back up, if a truck or something came around here, then you would have to back up for the vehicle, the bigger vehicle, to get around. But, for the most part, you're going to be all right sitting there. We see the dotted line in the center of the road, which means we can cross over. And, you see the dotted lines, the bicycle line goes solid to dotted. And, dotted is where you want to change lanes, to move to the right-hand turning lane. And, the light has gone red, so we stopped, behind the stop line. And it looks like the way is clear, so we're going to move forward, so we can see the intersection. And, we got vehicles coming. That vehicle is turning. All the other vehicles are in the other lanes, so we're going to move into the inside lane, and we have to merge across here. You can see the cautionary sign that says that our lane ends. And, you saw I had my signal on there for a good length of time. Crossed over the dotted line, and the vehicle behind me, when I had my signal on, let off the throttle, and I simply accelerated, and I was able to - between the two of us - we worked together, and created a spot that I was able to merge into, when my lane ended. And, you can see, here on the right, again it's not really a bicycle lane, per se, on the right, but bicycles could ride in there, on that solid line. And, solid line means that you don't cross over it. And, again, we're going to take a right-hand turn down here, across that solid line. So you can see that the solid line terminates at the slip lane, which makes it okay, but you still want to shoulder check, and make sure there aren't any bicycles, there's nobody in the pedestrian crosswalk, the traffic is not coming. And, we are clear to go. We're coming around the corner here, and we're going to do the right-hand turn. We've got the advanced. Turning into the left-hand lane, and moving over to the right-hand lane, immediately around the corner, and shoulder checking. And, you can see the bicycle lane on the right, here. And, here it's got green patches, it's solid and then it goes to green. And, where it goes to green is where you want to make the right-hand turn. 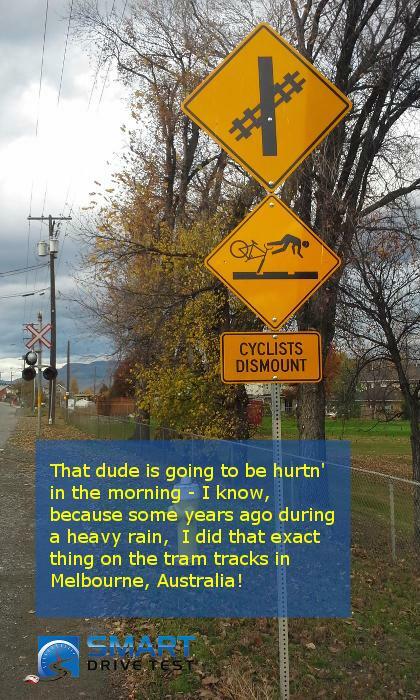 So, we don't deviate into the bicycle lane, to get up there. We stay in our lane, with our right signal on, and at that green section, on the roadway, that's where we move across the bicycle lane. So the traffic's moving off, we stay in our lane, we shoulder check. Check the mirror, shoulder check again. Nobody in the pedestrian crosswalk. Traffic is clear, and we proceed. And, that's how you do it, at those places. Now, preparation for making the right, we move the vehicle to the right side of the lane. You can see, you might be able to see in the dashcam, there's a bicycle lane over there, and again, we don't want to turn into the bicycle lane, you want to turn into your lane. So, you have to move out far enough to get into your own lane. And, I've had to move out here, so that I can see the traffic. And, I can see that once this pickup truck goes by, we're good to go. And, we move forward. And, right out into our lane, we don't deviate into the bicycle lane at all. And, now we're going to turn right at the next intersection here, and you can see the solid line. Now, you cannot cross into the bicycle lane, so you've got to go right up to the corner. And, of course, this guy's pulling up onto the sidewalk, here. And, I just waved that guy on, because he was sort of sitting in the intersection, and the light was going yellow to red. And, I've got a pedestrian here, and I don't know whether the pedestrian is going or not. No. Okay, and that's what you do, if you're not sure. And, as you saw, I waited right until I got to the intersection. You almost have to do a 90-degree turn there, to not deviate into the bicycle lane, because of that solid white line, you cannot deviate into that bicycle lane. And, as I saw there, I wasn't sure what other people were doing, so you saw that I just stopped, and I waited. And, that's what you have to do, for the purposes of a road test. If you're the least bit unsure what other road users are doing, just stop and wait for them to clear, or for them to get eye contact with you, to ensure that you're going to be safe, that you're not going to go around there. And, that pedestrian's going to step out. As soon as she got eye contact with me, and sort of nodded that I could go, then I proceeded around the intersection. As well, the other guy that was turning, he was already sort of committed. His vehicle was turned slightly, so I didn't turn in front of him, because it's a defensive move, on my part, that I was waiting to see what that driver was going to do. And, that's what happened. And, you can see once you get down, into these downtown areas, there aren't many bicycle lanes. I mean, your city may be different, where you're taking your road test. But, for the most part, this, Vernon, is an older city, did grow up to the motorcar, but downtown we don't have bicycle lanes. And, most of the corners are squared off, they're not big nice splayed corners for, that accommodate larger vehicles. If you get larger highways, and those types of things, you're going to notice that the corners are more rounded and splayed off, to accommodate larger turning vehicles. So, we're looking. No pedestrians. We got one vehicle, that's traveling quite slowly. And, we can proceed. And we turn into the inside lane, and then merge over to the right. As soon we come around the corner, merge to the right, it's a dash line, so we can cross it. And, again, we're shoulder checking, and making sure that there aren't any vehicles behind us. Nobody in the crosswalk, no pedestrian. And, we can see here, that the bicycle lane starts immediately. So, we do not deviate into the bicycle lane, when we're turning. The bicycle lane is on the right. And, again, we're going to turn right, at the next intersection. Solid white line, do not cross over that. There's a bicycle behind us, which is good. The bicycle, actually, is quite a distance back. So, you can see there's no dotted lines here, so we want to come up, as far as possible, and then try and get into your own lane. Try and encroach on the bicycle lane, as little as possible. That's actually a really good intersection. We'll go around, and do that one more time. Mirror, signal, shoulder check. Bicycle on the island, they're safe. There's no pedestrians, there's nobody coming. No cyclists. And, again, we're going to do this right hand corner here, with the bicycle lane. And, as I said, it's nigh-impossible to do this turn, without encroaching on the bicycle lane, but try to encroach on the bicycle lane, as little as possible. So, before you start to turn, get as close to the corner as you can, and then go around the corner, and aim to get in your lane, without deviating too much into the bicycle lane. So, sometimes that will happen with bicycle lanes, that you're going to have to encroach a little bit, just because of the way they painted the lines, there just isn't anything you can do about that. So, if you're making right-hand turns, and there's bicycle lanes, solid white lines, get up to where the two roads meet, before you start making your turn. And, here, you see the cyclist in the bicycle lane, they're good and clear. You do not need to move out of your lane, to pass that cyclist. You just stay in your lane, hold your course, and carry on. And, just keep an eye on them, as you're moving up here. And, you're going to move over to the right here, behind the intersection. And, this actually kind of worked out for me. If there was another vehicle in this cube, back there, you would have waited on the other side of the intersection, because you can't block the intersection. And, I'll put a card up in the corner for you, on blocking intersections, for the purpose of the road test. If the light is red, and the traffic is backed up to the intersection, and you don't have enough space, on the other side of the intersection, to clear the intersection, for the purposes of a road test, don't do that. Because, in some jurisdictions that is an automatic fail, or major demerits, for the purposes of your test. So, make sure that you can clear the intersection. So, you can see there's another bicycle lane here. We're going to make a right up here, and it's midway, sort of not really a block, it's kind of midway. So, you signal just past that intersection, and then mirror, signal, shoulder check, and make sure there aren't any bicycles. And, again, encroach on the intersection, as little as possible, when you're making the turn across the bicycle lane. But, it is imperative that you shoulder check. And, check the bicycle lane, and make sure there aren't any bicycles in that lane, as you're coming up. And, it's imperative that your shoulder check, before crossing over the bicycle lane. And, again, I'll put a card, up in the corner here, for you on shoulder checking, and how you need to shoulder check, for the purposes of a road test. Quick review of Bicycle lanes, for the purposes of passing a road test. Bicycle lanes are designated from the main lanes of traffic via solid white lines. And, this only applies in North America. Solid white lines means that you can't cross over them. You can't drive in the bicycle lane. And, as you saw in the footage there, in the main body of the video, some of the bicycle lanes, as the ones behind me here, can be a little bit faded. We're well into the summer, and they haven't repainted these yet. So, know that they're going to be faded in some parts, and you're really going to have to look for those, on your road test. And, this is the reason that you want to practice in and around the licensing center, where you're going to take your license, so you know that the bicycle lanes are, in fact, there. As well, as they fix the roads, and improve the roads, they're going to put bicycle lanes in. So, as you're traveling along a stretch of road, it's not unusual to go along and have a bicycle lane, and then all of a sudden the bicycle lane disappears, and then a few blocks down the road, it'll reappear again. So, keep that in mind, as well, on your road test. And, again, I come back to practicing in and around the licensing center, where you're going to be taking your test, so you know that about the bicycle lanes. 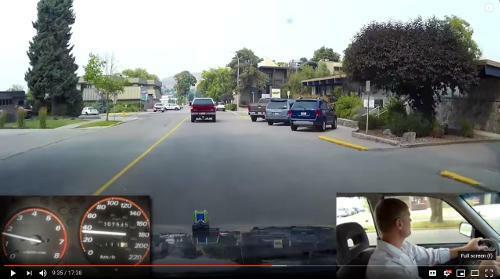 And, as well, in the body of the video there, you saw that one, where we couldn't help but actually deviate into the bicycle lane, because it was so far out into the intersection, that when we made the right-hand turn, we actually had to go in. But, you want to try and minimize the amount of how much you encroach into the bicycle lane, when you're making a right-hand turn. Try and box your turn more, so that you don't encroach into the bicycle lane. And, as well, you saw that when we come out from the cross streets, as well, that we had to box the turn, so we went right out into our lane, and not encroaching on the bicycle lane. 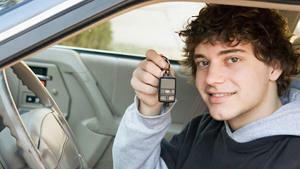 You want to minimize that, as much as possible, for the purposes of your road test. If you can do that, you're going to be successful on your road test. So, just box the turn, so go farther into the intersection, before you turn, that way you're not going to cross over into the bicycle lane. And, that's how you do that, for the purposes of a road test. Do you have bicycle lanes in the city that you are taking your road test? And, are they solid white lines, or are they something different? I know, for a fact, in Holland, some often times they're part of the sidewalk, and they're demarcated, from the sidewalk, with raised cement concrete. It's great pedaling in Holland, for sure. Leave a comment, down in the comment section, there. All that helps out the new drivers, going for their road test. If you like what you see here: Share. Subscribe. Leave a comment, down in the comment section. As well, if that thumbs up button. Check out all the videos, here on the channel, if you're working towards a license, or starting a career is a truck or bus driver. Lots of tremendous information here. As well, awesome online courses over the Smart Drive Test website. Head over there. Check out the courses. All the courses are guaranteed, pass your road test first time, or 30-day money-back guarantee. Later this summer, we're bringing out "Air Brakes. Explained Simply." It's a manual that updates the 40-year old CDL air brake manuals, currently in circulation. 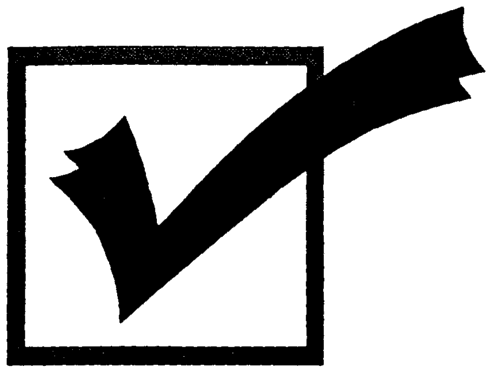 As well, there's 100 multiple-choice questions, that will help you to pass, and make sure that you do, in fact, pass first time your theory or practical CDL Air Brake exam. I'm Rick, with Smart Drive Test. Thanks very much for watching. Good luck on your road test. And, remember: Pick the best answer, not necessarily the right answer. Have a great day! Bye now. And, I'm speeding. See? That's what happens, that's why you have to practice for your road test. We're sitting at the intersection, and other people are wondering what I'm doing, talking to my camera. Yes. So, that will make a good part for the end of the video.